While many Mormons have rejected Trump's brand of conservatism, a subculture within the church is cheering for the president and pushing for a whiter, more nationalistic future. 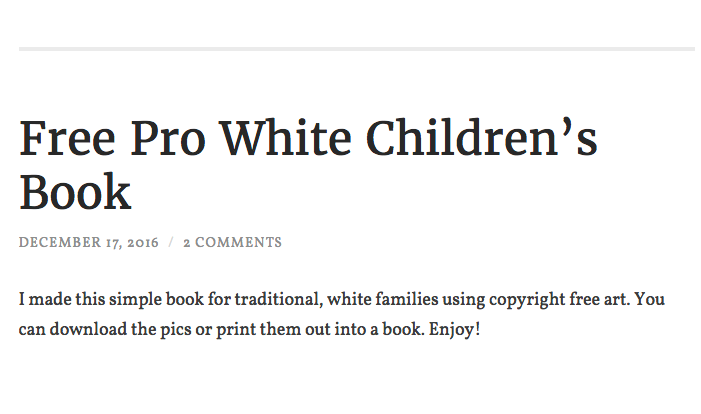 "Mormonism and Utah are the next target for cultural destruction," she wrote on her blog Nordic Sunrise, and the culprit is "black, ghetto culture." Her comment came in a post titled "Mormon 'Rap' and the Destruction of White, Western, Mormon Culture." It was jarring; Mormons are known for their moderate positions on issues like immigration and diversity, famously putting them at odds with now-President Trump. Extreme movements such as the alt-right — which catapulted into the public consciousness on a wave of support for Trump, Pepe memes, and white nationalism — are anathema to many members of The Church of Jesus Christ of Latter-day Saints (LDS). Much of Ayla's content fuses Mormon concepts with alt-right themes. On Twitter, she retweets David Duke, the former Ku Klux Klan leader, and uses the #whiteculture hashtag. On her blog, she describes herself as "a white-majority nationalist for America." She cites Mormon scripture as evidence that races should be separate, recently issued a "white baby challenge," and has argued that long-dead Mormon leader Brigham Young "predicted Cultural Marxism." Ayla isn't alone in her appreciation of David Duke's racist remarks. Members of the Mormon alt-right have Twitter timelines peppered with tweets about "white genocide," nationalism, and white supremacist slogans such as #14words. 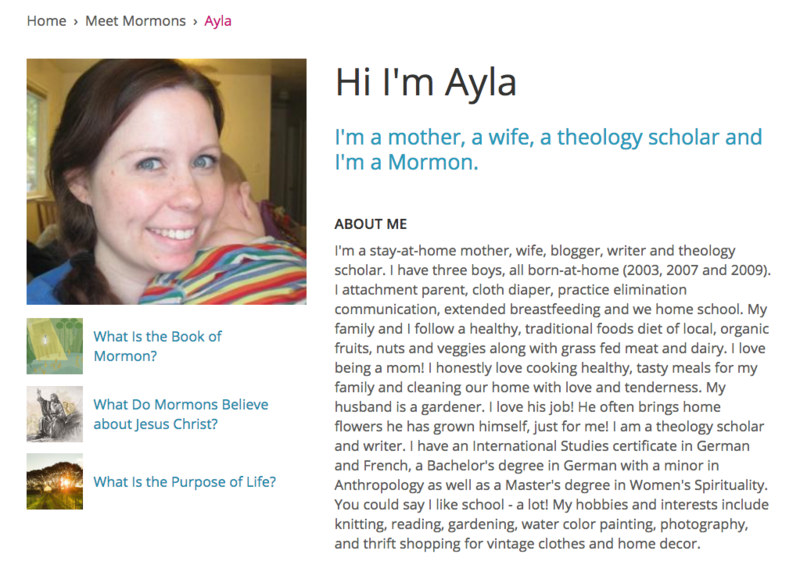 Ayla's profile on Mormon.org, a church hosted website, left, and a recent blog post she wrote, right. "It just really kind of boggles my mind to see racism in the LDS Church," Holly Richardson, a well-known Utah political blogger, told BuzzFeed News. "It’s a little disturbing when I see some of these comments. To me they're just the antithesis of what it means to a member of the LDS Church." Part of the issue comes down to interpretation. The Book of Mormon does include passages that describe an ancient people being "cursed" with dark skin. And the church infamously barred men of African descent from its lay priesthood between the late 1800s and 1978. Richardson, however, rejected this view of Mormon scripture and history, calling it a "misinterpretation." Janely Sanchez, a 25-year-old Latina Mormon who lives in Provo, Utah, called the racially-charged interpretations of LDS scripture "misconstrued" and "toxic." "The thing about A Purposeful Wife is I know that’s not my gospel," she said, referring to Ayla's Twitter handle. Robert Taber, a Mormon and history professor at the historically black Fayetteville State University, said that The Book of Mormon tells a story about a people who were destroyed by their "ethno-nationalism." "This is one of the core destructive things in Nephite society," Taber said, referring to the protagonists of The Book of Mormon. "This is a story of a people that failed." Still, Taber said Mormonism has "elements of a pretty racist tradition" as well as "elements of a pretty anti-racist tradition." Asked about the racially charged comments made by alt-right Mormons, Richardson said she's seen "quite a bit of it" in the church's home state of Utah. Sanchez said she's experienced discrimination in Utah, but wouldn't characterize most Mormons as racist. The culture is still "catching up" and there are issues with people "living in a bubble" and stereotyping others, she said. "I do want to hear the church disavow white supremacy," she added. "And I want people to be reminded that this is a world wide church." Crystal Young-Otterstrom, a national co-chair of LDS Democrats, was "shocked" when she recently read one of Ayla's blog posts circulating on the web. Racism has "no place in Mormonism," she said, and the church needs to do more to clarify and disavow racist elements of its past. "It's going to take more than one talk to get it out of our culture," Young-Otterstrom told BuzzFeed News. "It’s going to take more examples of leadership embracing differences and talking about how differences make us great. We need leadership saying things like, 'this is racist talk and that is not okay.'" One man, who identified himself by his twitter handle @JRuebenClark (the name of a now-dead Mormon leader, and the namesake of Brigham Young University's law school), said in an email that he is an active Mormon and "simpatico" with the alt-right. He described the "unifying principle of the alt-right" as being against political correctness, adding that his "Mormon beliefs are certainly a huge reason why I find Leftist sexual politics so horrifying." "I wholeheartedly believe that the trans movement is literally diabolical," he said. "By 'literally diabolical,' I don't mean 'really bad,' I mean Satanic." Clark said Mormonism is "not compatible with the 'Hitler Did Nothing Wrong' contingent of the alt-right." But when people like Ayla "cite The Book of Mormon or the Bible to support nationalist ideas, they aren't wrong," he said. "Mormons are nice people," he said, "and the alt-right largely isn't nice, and so it seems antithetical to Mormonism." "We believe we are all children of God," Hawkins said in an email. For now, the Mormon alt-right looks like it's here to stay, along with the larger movement that continues to influence American politics via media outlets like Breitbart. Ayla, the de facto queen of alt-right Mormons, has more than 20,000 followers on Twitter, and her blog continues to generate discussion in Mormon circles. On her YouTube channel, she touches on her conversion to both Mormonism and conservatism, gardening, and making "more white babies." Ayla's most-watched video — published in September 2015 and praised on a white nationalist forum — has been viewed more than 100,000 times. In it, Ayla blasts the "Muslim invasion of Europe" and blames feminism for the refugee crisis. "It's gone to heck," Ayla says in perhaps the most Mormon comment ever uttered from within the alt-right. What Kind Of Mormon Are You, Really?